Cranberries are the fruit of a low woody shrub of the genus Vaccinium, which grows naturally in mountain woods. Today cranberries are mostly cultivated and mechanically harvested for commercial purpose. One of the cousins of blueberry, cranberry is a small, round fruit with a rather bitter or acidic flavor. The color varies from white to brilliant red depending on when cranberries are harvested. Specifically, white cranberries are simply regular cranberries which are harvested early, before they turned to red. 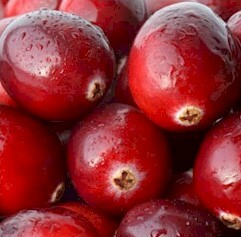 Cranberries can be eaten fresh or after being deep-frozen. In fact, report shows that frozen-thawed cranberries give better yield in terms of its taste, nutritional values and juice amount. They can be eaten as they are, or used to prepare jams, jellies, syrups or fresh, healthy juices. According to several research studies, cranberries are one of the foods with the highest anti-oxidant content, since they are an excellent source of phytonutrients anthocyanins, proanthocyanidins, resveratrol and tannins that give cranberries the blue, purple and red pigments. They are rich in vitamins A, C and E; and a good source of organic acids (such as malic, succininc and citric acids), selenium, manganese and copper, just to name a few important trace minerals. They also provide moderate amounts of the B vitamins, folate and iron. Anti-aging: Several aging-related conditions, such as degenerative disorders of many organs and tissues and certain types of cancer, are associated with cellular damage from free-radicals. Due to their high content in anti-oxidants, cranberries can help prevent and fight such free radical-induced damages and hence protect the body against the risk of developing aging-related diseases and conditions. Anemia: Cranberries are an excellent source of vitamin C (which enhances the intestinal absorption of iron) and also contain moderate amounts of iron and folate, which are essential for the synthesis of hemoglobin and the maturation of red cells. This is why cranberry juice can be a great aid in the prevention and treatment of many different types of anemia. Atherosclerosis and cardiovascular disease: The anti-oxidants found in cranberry juice can help prevent the oxidation of LDL-cholesterol, which is one of the first step involved in the formation of atherosclerotic plaques. It is well known that atherosclerosis is one of the leading cause of cardiovascular disease, stroke and heart attack. Therefore cranberry juice can be used as an effective preventive remedy against these conditions. Diarrhea: Cranberries can help control and combat different types of diarrhea, especially those caused by alteration in the intestinal flora which allows E. coli bacteria to grow without control and release toxins responsible for water accumulation in the intestine and hence diarrhea. The anti-diarrheal effect of cranberry juice is due to its antiseptic properties, as well as to its content in tannins and anthocyanins which prevent the bacteria from adhering to the intestinal walls and then grow and proliferate. Digestive disorders: Due to their content in organic acids, cranberry juice can help stimulate the secretion of saliva and gastric juice, which contain the enzymes responsible for digestion of starch and proteins. Eyesight/vision: Although cranberries are less effective than blueberries in preventing and treating eye conditions, they are also helpful. In addition, anthocyanins act on eye’s capillaries by improving the blood flow to the retina, thereby helping to improve sight and treat certain types of retinal degeneration. Kidney stones formation, prevent: Cranberry juice helps excrete oxalic acid and uric acid from the kidneys. It contains quinic acid that is useful to prevent kidney stones formation in kidneys. Probiotic: Cranberries is an anti-biotic and also a probiotic. It has the ability to kill certain viruses, bad bacteria and pathogens; while acting as a natural probiotic to help breed the good bacteria. This promotes a healthy intestinal flora. Skin conditions and disorders: The topical application of certain cranberry formulations in form of lotion or cream can help prevent and treat skin irritations, eczema, couperose, as well as many other skin conditions associated with weak capillaries. Venous disorders: It has been shown that anthocyanins found in blueberries and, at a lesser extent in cranberries, help protect and strengthen the walls of veins and capillaries, thereby improving the symptoms of varicose veins and swollen legs. Urinary tract infections: Fresh cranberry juice is particularly helpful to remedy and prevent urinary tract infections, especially cystitis (bladder infection) from E. coli by “stripping” off the bacteria from adhering to the walls of the urinary tract and then proliferate. 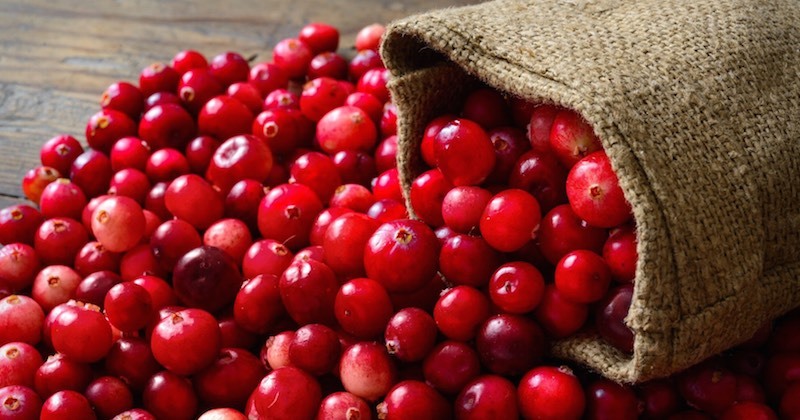 To store cranberries for a long period, store in refrigerator unwashed. Properly frozen cranberries can even be kept for years, but must be consumed immediately after thawing. Due to its acidic “tarty” taste, cranberry juice is best mixed with other more palatable juices like juices of carrots, pears, apples or oranges. Most commercial cranberry juices are sold with added sugar and additives, hence may not provide the desired effect for healing of the above-mentioned conditions.